The Mayor’s Office of Community Empowerment and Opportunity is the lead agency that oversees the West Philadelphia Promise Zone, but more than 100 local partner organizations, including public agencies, service providers, civic groups, universities, and hospitals, work together to advance work in areas that include education, economic opportunity, health and wellness, housing, and public safety. Access to high quality education creates pathways towards opportunity, and with changing workforce requirements, it has become increasingly important to have higher educational attainment. From quality pre-kindergarten programs to high performing K-12 schools to adult literacy and workforce training, education shapes trajectories. The Promise Zone Education committee connects city, nonprofit and private organizations to support education initiatives in the Promise Zone. In many ways, West Philadelphia is experiencing an economic boom. Universities and anchor institutions are expanding, and many Promise Zone neighborhoods are seeing increases in property values. The overarching economic opportunity goal is to make sure that this development is equitable—that residents of the Promise Zone have access to this growing economic opportunity. The committee focuses on a wide array of topics from physical development, to anchor institution procurement, to small business development, and economic security. The happiness and the vitality of a community often largely rely on the health and wellness of its residents. The Health and Wellness Committee focuses on increasing the physical and mental health of residents in the Promise Zone while increasing access to care. Neighborhoods in West Philadelphia have diverse housing stock, and housing partners help residents maintain their homes and improve their affordability through educational and outreach services. As University City grows, so does the importance of investing public resources that respect community priorities and create housing options for a variety of income levels. In 2012, the Mantua neighborhood was awarded a Byrne Criminal Justice Innovation Grant, which is a community-oriented initiative focused on crime and crime clusters (“hot spots”) within a neighborhood. 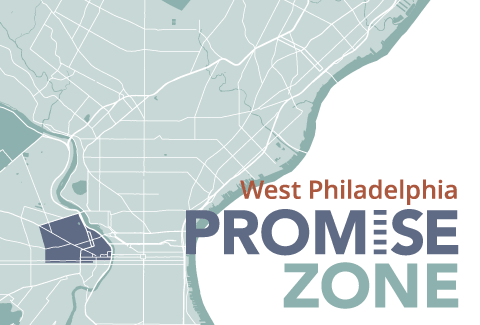 Building off of this grant, the Public Safety Committee connects City, nonprofit, private sector, and resident stakeholders to address crime and public safety issues within the Promise Zone. Crime Prevention Through Environmental Design (CPTED): Make changes to the physical spaces of crime hotspots to deter activity in those areas.